Blogg om Økonomi, Finans, Lån & Penger - Privatøkonomi. Privatøkonomi.net blogger om privatøkonomiske spørsmål. 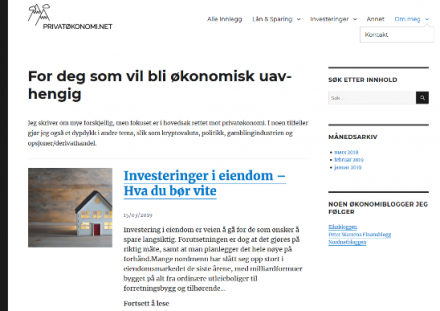 Les mer om finansiering, bank, folkefinansiering & Eiendomsinvesteringer. Description: Privatøkonomi.net blogs about private financial issues. Read more about financing, banking, public finance & real estate investments. Scottish Blogs (Popularity: ): For Scottish blogs. Blog Oklahoma Net Ring (Popularity: ): Open to all Oklahoman's who blog. Pakistani Bloggers (Popularity: ): A webring for bloggers of Pakistani origin. iMood (Popularity: ): Displays a graphic on your site that reflects your mood. Blogrolling.com (Popularity: ): Easy to use service to manage your links and buddy lists on your blog. blogBuddy (Popularity: ): A Windows application for managing sites using blogger.com or others that implement the Blogger API. BlogniX (Popularity: ): Native QT/XmlRpc-c based Linux blogging client. Max's World (Popularity: ): Sarcasm, free associations, and miscellaneous puns and litotes from SF Bay Area writer Max Gerry. Blog on Blog (Popularity: ): A group blog offering review and snarky commentary on other blogs and online journals.